Three people have been arrested on suspicion of causing a Wisbech man's death due to dangerous driving. A 42-year-old man died in Bretton Way yesterday afternoon at about 5.20pm at the junction of Deerleap and Bretton Way in a collision involving a motorcycle, a Peugeot and a Saab. The road was closed between the Bretton Way BP garage and Tyesdale roundabout and remained closed for around seven hours while police worked at the scene. 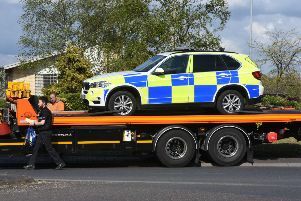 A 22-year-old man of no fixed abode, a 20-year-old man from Peterborough and a 16-year-old girl from Peterborough have all been arrested on suspicion of causing death by dangerous driving and taken to Thorpe Wood Police Station where they remain. The 22-year-old was also arrested on suspicion of aggravated vehicle taking and drug driving and the girl with aggravated vehicle taking. The 20-year-old was also arrested for theft of a motor vehicle and drug driving. Anyone who witnessed the collision should contact the Road Policing Unit on 101 quoting CC-22082018-0370.